Mary was born in Italy, she attended painting and decoration courses at the Academy of Fine Arts in Naples, first, and then in Milan. In 2006, a three-month staying as an au pair between Philadelphia and New York (and a parenthesis as Jennifer Blazina, professor at Drexel University art assistant) strongly influences her work, like all journeys, long or short, she can’t help but constantly undertake. In 2010 she participated in “Capturing the elusive here”, a workshop held by the Spanish-American artist Isidro Blasco at AreaOdeon in Monza. In the same year she joined the group exhibition Eruption at the White Box gallery in New York. She exhibited her work at the 54th Venice Art Biennal. In 2012 Professor Ada Patrizia Fiorillo mentioned her for Bice Bugatti – Giovanni Segantini Award. She is one of the finalists of the Marina di Ravenna prize in 2012, and the Centre-Periphery competition 2014 by Federculture. Her artwork “Salon d’automne” is in the museum of environmental art at Giffoni Sei Casali. In 2014 she collaborated with the Dutch collective Company New Heroes, the European Seismic urban innovation project, and was selected for the European Youth Exchange Babel in Turku (Finland). In 2015 her solo show “Un’idéè de ​​Paris” (curated by Chiara Reale and Lara Carbonara) is hosted at the French Institute of Naples. 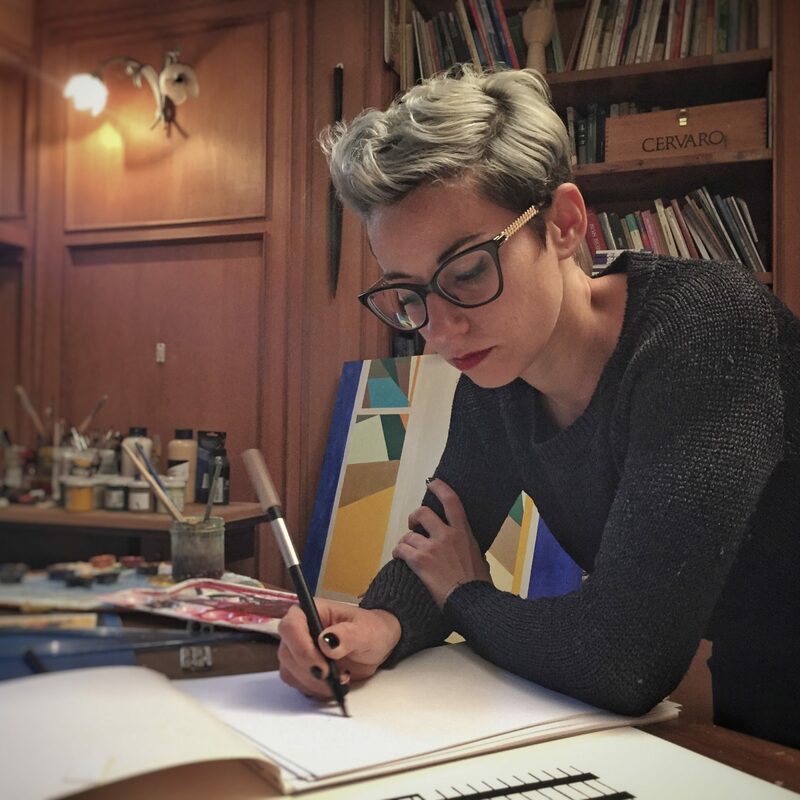 In 2016 she joined SetUP Art Fair with the Casa Turese gallery; in the same year she had her solo show “L’illusione di Dedalo“, curated by Massimo Bignardi, at Centro Luigi Di Sarro in Rome and at the Italian Cultural Institute in Cologne, Germany. Her work “Puntini (Lanificio)” illustrates the poem “Condominio Napoli” by Benigni, in poetry magazine Levania #4 and her work 015titled#09 is in Imago mundi Luciano Benetton collection, curated by Chiara Pirozzi. In November 2017 she’s been invited to the first Catalyst Art Retreat at Casa Berti, Lucca (IT). She is among the 100 artists selected for the first Los Angeles Saatchi Other Art Fair. Genius Cinque, Amarelli Showroom, curator Gianni Nappa. 2015 Un’idèè de Paris, Institut francais Naples, curators Chiara Reale and Lara Carbonara. 2013 Urban Stories, MARTE, Cava dei Tirreni. Curator: Ada Patrizia Fiorillo. 2011 Acque d’Italia, Federico II University, Naples. Città in istanti, Siena University. Curator: Massimo Bignardi, Federica Marras. 2010 Cover, Madre museum, Naples. 2009 Acque Chiare, Palazzo Sasso – Ravello. Curator: Massimo Bignardi. Giramondo, Foundry, London. Curator: Pasquale Ruocco. Aereo, Largobaracche, Naples, Curator: Valentina Rippa. 2016 IL TUTTO è Più DELLA SOMMA DELLE SUE PARTI. San Benedetto del Tronto Curator: Maria Letizia Paiato. Trames tramites, council of ministers Porta degli angeli, Ferrara. 2012 NINA, PAN museum, Naples. Curators: Cassese, Di Capua, Rivosecchi. 2011 54 Venice Art Biennal, Region of Campania pavilion. Curator: Vittorio Sgarbi. Oleum, FRAC museum, Baronissi. Curator: Massimo Bignardi. 2010 Razzano award, exhibition of selected artists, ARCOS museum, Benevento. Explorart, Areaodeon, Monza. Leading artist: Isidro Blasco. 2009 Impresa da talenti, PAN museum, promoted by Union of Industrialists, advanced services section, Naples. Curator: Maria Savarese. Eruzione/eruption, White box gallery, New York. Curators: Giuseppe Ruffo and Pietro Tatafiore. 2008 Ceres 4 art, Milan. 2007 13×17, curators: Philippe Daverio and Jean Blanchaert. 2007 Il viaggio, TRIP, Naples. Curators: Graziella Lonardi Buontempo, Ninì Sgambati, Emanuela de Cecco, Derek Hudson, Grazia Neri, Stefano De Stefano, Giulio Baffi, Pasquale Esposito. 2005 Notes, Villa Rufolo, Ravello. Texts by Adriana De Manes. 2002 Anatomie, in celebration of the Academy of Fine Arts 250th anniversary, Naples. 1999 Il sentiero degli dei. Documenti ’99 Agerola. Curator: Massimo Bignardi. 2013 Massimo Bignardi, Praticare la città Arte ambientale, prospettive di ricerca e metodologie di intervento, Liguori. 2012 Antonio Di Foggia, Quando la città, Media Naonis. 2005 Muri parlanti, edited by Massimo Bignardi and Mary Cinque, 10/17 Edition, Salerno. 2017 Atlante dell’arte a Napoli e in Campania, Madre Museum, Naples, artem Edition. 2016 Il tutto è più della somma delle sue parti, curator: Maria Letizia Paiato. 2014 Mantegna Cercasi Award, Confcommercio Mantova. Centre-Periphery Award, curated by Federculture, Terme Diocleziano, Rome. 2013 Iside contemporanea, edited by Ferdinando Creta, ARCOS museum, Benevento. 2012 NINA, edited by Cassese, Di Capua, Rivosecchi, Artem, Naples. Bice Bugatti, Giovanni Segantini award, Nova Milanese. 2011 54 Venice Art Biennal, Italian pavilion. Oleum, edited by Massimo Bignardi, Claudio Grenzi Editore, Foggia. 2010 Razzano award, ARCOS museum, Benevento. Eruption/Eruzione, edited by Giuseppe Ruffo e Pietro Tatafiore. Artefatto, Candy world, promoted by GAI and Trieste township. 2009 Massimo Bignardi, edited by, “Acque chiare”, Bruno Mansi Editore, Ravello. Impresa da talenti, promoted by Union of Industrialists, advanced services section, Naples. La dèfense priorità dello spazio necessità del tempo, edited by Pasquale Ruocco. Sguardi irrequieti, edited by Marcella Ferro and Pasquale Ruocco. 2007 13×17, edited by Philippe Daverio and Jean Blanchaert. 2002 Anatomie, Academy of Fine Arts, Naples.